I had the distinct pleasure of seeing James Cameron's last epic, "Titanic," on opening night, Dec 19, 1997, just after taking my statistics final. I remember going in not knowing what to expect, but having heard about all the money that had been thrown into the film and its special effects. Someone in the business once said that Cameron was the type of director where every dime he spent went up on the screen - the film could cost $5 million, but it would end up looking like $20 million. When I left Titanic that night with my date (in sobs), I knew that assertion was factual. 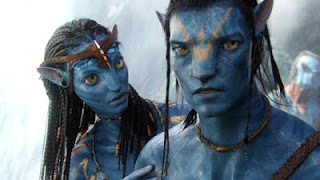 And last night returning from Cameron's latest fare, "Avatar," I learned it all over again. Like any fine work of art, "Avatar" is a visually stunning work that makes a political statement, forcing its audience to challenge conventions set in stone within themselves. Furthermore, as art, it leaves room for interpretation while leaving a lasting impression. With the advent of effects techniques made possible by characters such as Gollum in the "Lord of the Rings" trilogy and Jar-Jar Binks in Star Wars 1, 2, and 3, Cameron was able to create simulated characters that emote and realize a lush, green world composed entirely on computer. The result is a symphony of live-action and animated wonders. The film's heroine, Neytiri, played by ascending star Zoe Saldana, is the daughter of the Na'Vi leadership and is charged with the training of the protagonist, parapalegic Jake Sully, a marine who makes the trip to planet Pandora after his twin brother is killed on Earth. At first, Jake seems fine to infiltrate the native people of the planet to advance the plans of the military contigent. Through his trials, however, he earns the respect of the Na'Vi people, finds love, and a new causes worth fighting for. It's a charming, simplistic story line that works just like it did in Titanic - transformative love as a catalyst for change. For those well-versed in Cameron's film repetoire, there were a great many wonderful allusions to films past. The score, composed by James Horner who also composed for "Titanic", is both tribal and majestic, and carries notes similar to those heard in "The Mask of Zorro" and "The Patriot." These were also films where the action sequences relied heavily upon strong percussive undertones to drive the story. Some character archetypes were familiar too. In "Aliens," Cameron featured a strong Latina in the character of Vasquez, whose death in a fiery explosion signified a sacrifice. In casting Michelle Rodriguez as helicopter pilot Trudy, James has borne another courageous latina imbued by duty, willing to sacrifice. Also of note are the alien beings, the Na'Vi, who bear a striking resemblance to the creatures in Cameron's 1989 "The Abyss." Save for the translucent skin and residing beneath the sea, these two races could be cousins. Not to mention the hardware - all the guns have a Terminator feel, and the robotic transport vehicles used by the soldiers scream "Ripley on the loading dock." These similaries are sure to make film afficienados chuckle when recognized. Of course, it's also entirely possible that Cameron's way of making the film more digestible was to build in familiar cues for the general audience to latch on to, a calculated and smart design indeed. At times the film got a little preachy, it's only drawback. There were many backhanded comments about the nature of undue force and disenfranchisement; about the perils of war and the reasons its waged; about the importance of allegiances and knowing when they should (if ever) change. Cameron faced a similar pitfall in 1989, when his eventual director's cut of The Abyss had to trim 20 min of dialogue toward the end, relating the reasons why the aliens wanted to obliterate mankind due to its nuclear bomb-favoring ways. The theatrical version is a far better film as a result, as audiences would have been turned off and removed from the story by its anti-war message. This time, Cameron weaves the message throughout the film, and the result is occasionally offputting. While I don't think this film will inspire the same frenzy as Titanic did in his months' long run in theatres (i.e. long lines of repeat viewers into late January that included irish folk music and people dancing while waiting in line), there is definitely an epic quality to the film which will mesmerize audiences into making it apart of their home collections when the time comes. That won't be any time soon though - the visual effects are best seen on the big screen and word of mouth will keep the box-office strong well into January 2010. Until then, be sure to tell your friends to visit the local multiplex and check out 'Avatar", a visual masterpiece worthy of a closer look.